It happens 10 times and quits. It works fine when I put the original chip back in. If anyone has any experience with this I'd be very grateful! Trying the burn bootloader steps, and I'm getting a new error. I'm doing the 8MHz option, and so I downloaded the breadboard-1-6-x.zip file. (I'm using Arduino IDE 1.6.5 on Mac). I uploaded the ArduinoISP example to my working chip, then wired it up to the breadboard as per the picture. 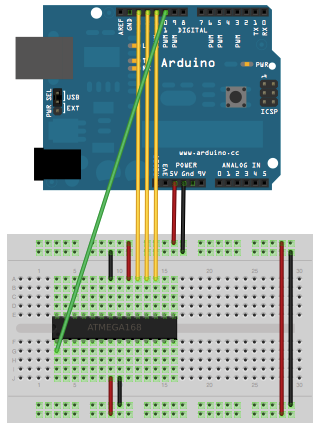 Arduino: 1.6.5 (Mac OS X), Board: "ATmega328 on a breadboard (8 MHz internal clock)"
System wide configuration file is "/Users/andy/Desktop/Arduino.app/Contents/Java/hardware/tools/avr/etc/avrdude.conf"
User configuration file is "/Users/andy/.avrduderc"
avrdude: stk500_initialize(): (b) protocol error, expect=0x10, resp=0x01 avrdude: initialization failed, rc=-1 Double check connections and try again, or use -F to override this check. I jumpered the pins shown at the 1:30 mark to the ICSP port, and tried burning the bootloader twice per chip, and on the second try it worked! Don't know why it had to be tried twice. I may go back to trying the breadboard method, just to see if it works if I try burning it twice. It's because these are unprogrammed chips, meaning they haven't had a bootloader programmed into them yet. Here is a tutorial for using your Arduino board to program a bootloader into them (there are many such tutorials available). It only needs to be done once per chip so it will be worth your while to program all of them, once you have set up to do one. This is a very economical way to build "home-brew-duinos". Make sure that you have the right driver for the chinese boards, and the right com port picked in the ide. Not the answer you're looking for? Browse other questions tagged arduino-uno arduino-ide atmega328 or ask your own question. How to reset ATmega328P fuses using USBasp programmer?